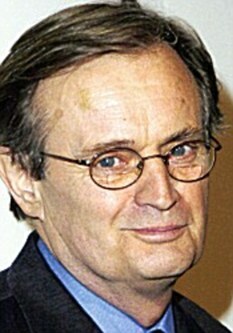 Actor David McCallum, 77, is most famous for his roles in the classic TV series The Man From U.N.C.L.E. Now starring in NCIS, he lives in New York with his second wife, Katherine, with whom he has a son and a daughter. He also has two sons from his first marriage. David says: This is a photograph of me aged about 12 at University College School in Hampstead, north-west London. I was born in 1933 in Glasgow. My parents were both musicians. My mother, Dorothy, was a cellist and my father, David, was first violinist. With my older brother, Iain, we moved to Hampstead in 1936, when Father became leader of the London Philharmonic. My first school there was a tiny kindergarten. All I remember is that our teacher wore mauve silk stockings and, aged three or four, I always tried to sit up close to her so I could feel those silk-clad legs. Anyway, we came back to London and I won a scholarship, aged ten, to University College School. It was an amazing place. The headmaster used to walk around with a Sudanese spear, and as it was a Classics school, everything was in Latin. Learning Latin and Greek for eight years was wonderful, but it meant we studied history and geography less than is usual. At home, music was omnipresent, and my parents both assumed at first that I would follow them into the family business. As a child I would go with my father down to the studios where Jascha Heifetz, the famous violinist, was recording Brahms. I remember Heifetz’s G string broke at one point, and he handed it to me. My father polled friends about which instrument I should study, with a view to future employment opportunities, and settled on the oboe. There was I, still a young boy, and he was choosing my profession; but I was happy to comply. I was in the school orchestra and gave the odd recital. But I was also involved in amateur dramatics. I still play the oboe, but music never grabbed me the way that acting did. One time I played the part of the doomed prince in the dungeon in Shakespeare’s King John. I pleaded, unsuccessfully, with the assassin not to kill me. It is a real tear-jerker, and the audience applauded wildly at the end. It was in that moment I realised that my home in this world was on a stage. Best of all, my efforts as an actor didn’t involve homework or the sort of practice that music requires. I did what was necessary in school and sought acting work at the earliest opportunity. From then on I worked behind the scenes as well as on stage, both at school and with amateur dramatics groups. And in one summer holiday I apprenticed myself to Mr Wiggly, the local electrician, so I could make myself even more useful in the theatre. I started working for the BBC in 1946 when I was 12, playing boy voices for the BBC radio repertory company. What fun, and I got my Equity card too. My father was working for the BBC at the time and introduced me to actor Laidman Browne, who was then in charge of that whole group of actors and actresses, including stars like Gladys Cooper. It was an extraordinary experience. Nobody really knew about it at school. I was a well-behaved boy, but I did get in trouble in one school Shakespeare production. I played Trinculo, the jester in The Tempest, and after seeing me perform, the headmaster called me into his office and said there was too much clowning going on. I had read that Shakespeare had been somewhat bawdy, and I thought my antics were perfect. So I did it the same way at every performance; I wasn’t going to take any notice of the headmaster because, as far as I was concerned, he didn’t know what he was talking about. A couple of years later, after this same headmaster had lectured the Upper Sixth on the perils of homosexuality, he hanged himself that same night. No one had any idea why! I did my final exams at 18, and after my military service with the Royal West African Frontier Force, I went to RADA. It was interesting, and I was there with Joan Collins, but it seemed a little silly in some ways compared to just doing the job. I started in repertory theatre as soon as I left. My father sometimes felt, as I was going along, that I was wasting my life. He thought I was working incredibly hard and making no money at all. But my parents’ philosophy was simple. They gave my brother and me a secure environment that allowed us to go out and achieve our maximum potential. They never interfered, only encouraged. We both made our own decisions and lived by the consequences. I knew my father felt that music would give me a better standard of living than the vicissitudes of the theatre, but he didn’t say it openly. NCIS is on CBS Action (Sky 148/ Freesat 137), weekdays at 9pm.